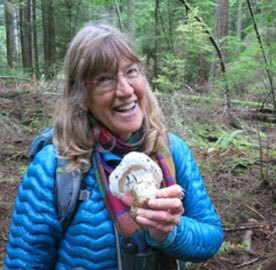 Libby Mills is a naturalist and artist who has taught North Cascades Institute seminars for more than 25 years. She is on the board of Skagit Audubon as the Field Trip Chair, leads regular classes in natural history for Padilla Bay Foundation and enjoys taking people into the natural world to observe, learn and sketch on both east and west sides of the North Cascades and beyond. A biologist for The Nature Conservancy’s Skagit River Bald Eagle Preserve for 23 winters, Libby worked for nine years as a ranger/naturalist in national parks and taught four summers at the Audubon Ecology Camp in Maine and aboard ships from Baja to Alaska. She records the sights and sounds of nature in field journals and on audiotape and illustrated A Guide to Bird Finding in Washington, Brown Bear Summer and Wildflowers of Glacier Bay and Southeast Alaska.